Join us for the 2018 winter series of fruit tree and gardening classes. 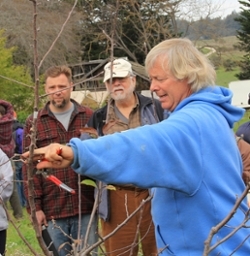 Matthew Sutton, owner of Orchard Keepers, will lead several of this winter's fruit tree workshops. Orin Martin, manager of the Alan Chadwick Garden, will share his expertise on roses, fruit trees, and garden bed preparation during the 2018 winter workshop series. The 2018 winter schedule of community gardening workshops features something for every gardener. 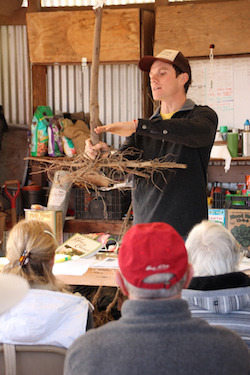 Whether you’re a rose lover, a fruit tree fan, or are curious about the best way to increase vegetable production in your garden, you’ll find a workshop to fit your needs. Instructors include Orin Martin, who has managed the Alan Chadwick Garden for 40 years, along with Matthew Sutton, founder and owner of Orchard Keepers, and Daniel Paduano, owner of Abounding Harvest Mountain Farm and an expert in citrus growing. Workshops are geared to beginning and intermediate gardeners and fruit tree growers, although all experience levels are welcome to attend. Workshops are sponsored by the Center for Agroecology & Sustainable Food Systems (CASFS), and the Friends of the UCSC Farm & Garden.